Heat oven to 325°F. Grease bottom of 8-inch cast-iron skillet with shortening. Make brownie batter as directed on box for cakelike brownies. 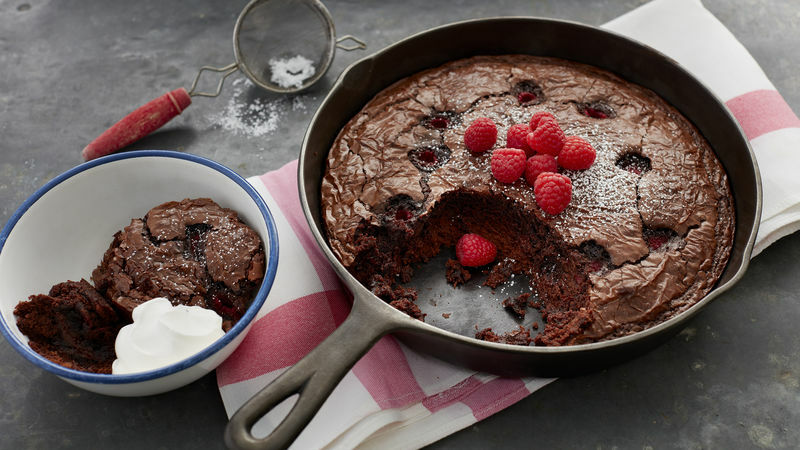 Spread half of the brownie batter in skillet. Break chocolate bar into squares. Arrange chocolate squares on top of batter starting around edge of pan, leaving very center uncovered. Top with remaining brownie batter. Sprinkle with 1/4 cup raspberries. Bake 45 to 48 minutes or until toothpick inserted in center comes out almost clean. Cool 45 minutes. Sprinkle with powdered sugar. Cut into wedges, and serve warm with fresh raspberries, if desired. Go ahead and treat yourself! Serve this with a scoop of ice cream, gelato or a dollop of fresh whipped cream.